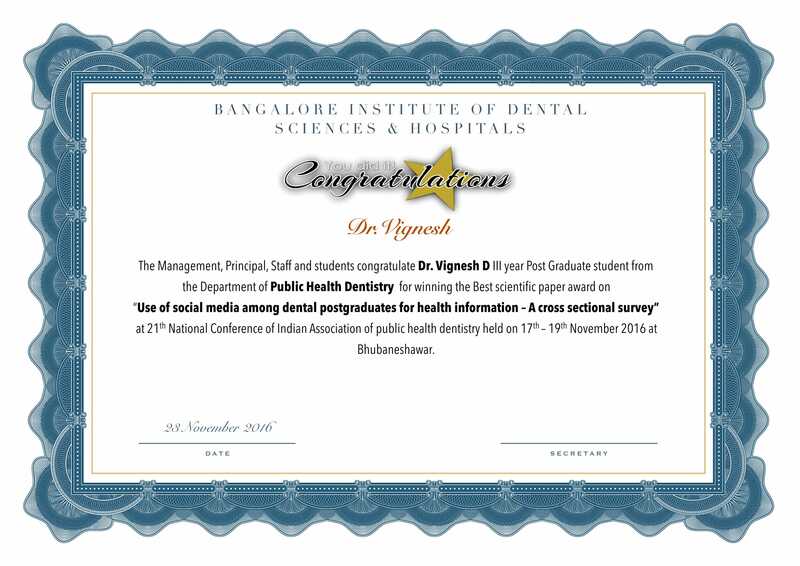 The Management, Principal, Staff and students congratulate Dr Vignesh D III year Post Graduate student from the Department of PUBLIC HEALTH DENTISTRY for winning the Best scientific paper award on “USE OF SOCIAL MEDIA AMONG DENTAL POSTGRADUATES FOR HEALTH INFORMATION - A cross sectional survey ” at 21st National conference of Indian Association of Public Health Dentistry held on 17th - 19th December 2016 at Bhubaneswar. The Management, Principal, Staff and students congratulate Dr Cecile Priyanthi A I year Post Graduate student from the Department of ORAL MEDICINE AND RADIOLOGY for winning the Best scientific paper award on “AURICULOTHERAPHY- press to depress the ailment” at 28th National conference IAOMR held on 15th, 16th & 17th December 2016 at Kanyakumari, Tamilnadu . The Management, Principal, Staff and students congratulate Dr Pragathi D S II year Post Graduate student from the Department of PUBLIC HEALTH DENTISTRY for winning the Best scientific paper award on “ROAD BLOCKS TOWARDS PUBLIC HEALTH DENTISTRY AS MDS SPECIALITY AMONG INTERNS IN BENGALURU” at 21st National conference of Indian Association of Public Health Dentistry held on 17th - 19th November 2016 at Bhubaneswar . The Management, Principal, Staff and students congratulate Dr Sruthi Ramesh II year Post Graduate student from the Department of PUBLIC HEALTH DENTISTRY for winning the Best scientific paper award on “INTERNET ADDICTION AND ITS RELATIONSHIP WITH INSOMNIA AMONG DENTAL POSTGRADUATE STUDENTS IN BENGALURU CITY - A cross section study” at 28th National conference of Indian Association of Public Health Dentistry held on 17th - 19th December 2016 at Bhubaneswar . The Management, Principal, Staff and students congratulate Dr.Gaurav III year Post Graduate student from the Department of ORAL MEDICINE AND RADIOLOGY for winning the Best scientific paper award on “NEUROTROPHIN BLOCKERS CONQUERINGOROFACIAL PAIN - Unfolding a new era systemic review " at 28th National conference IAOMR held on 15th, 16th & 17th December 2016 at Kanyakumari, Tamilnadu . Very helpful, worth attending, Good speaker – DEPT OMFS. Very useful, good videos, good demonstration, interactive sessions- Dept OMFS The training was very helpful as there was individual participation too. – Dept Endo. The CPR with AED hand s -on was very helpful. Very useful and interactive. The hands -on for CPR, AED and bandaging techniques were helpful. It has been an enriching experience, learnt everything necessary for basic life support and first aid. The speaker was very informative and had good communication skills. First day was very interesting and informative and this should be made mandatory for all students as they are basic life support skills. It was very useful for us. It was something which we were looking forward to learn. We did learn so many things and things we could put good use to in the future. I/we the students of BIDS thank all the members of Redcross Society for giving this precious time to educate us with such good knowledge. The training was very useful. I graduated in 1999 & I am an academician working in Chennai. 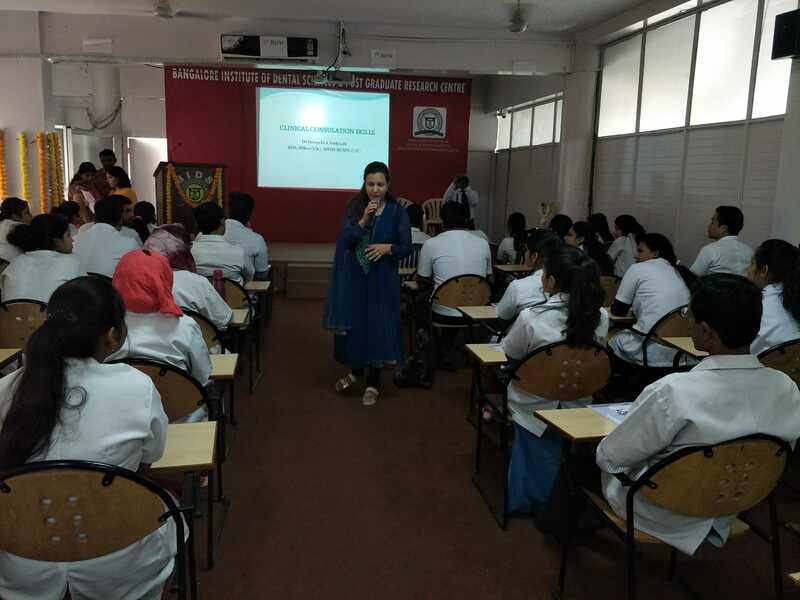 As an undergraduate in Bangalore Institute of Dental Sciences, I received an education that was second-to-none along with the academic & clinical staff alike. The skills learnt have enabled me to take great pride & find joy & satisfaction in my day-to-day working life. 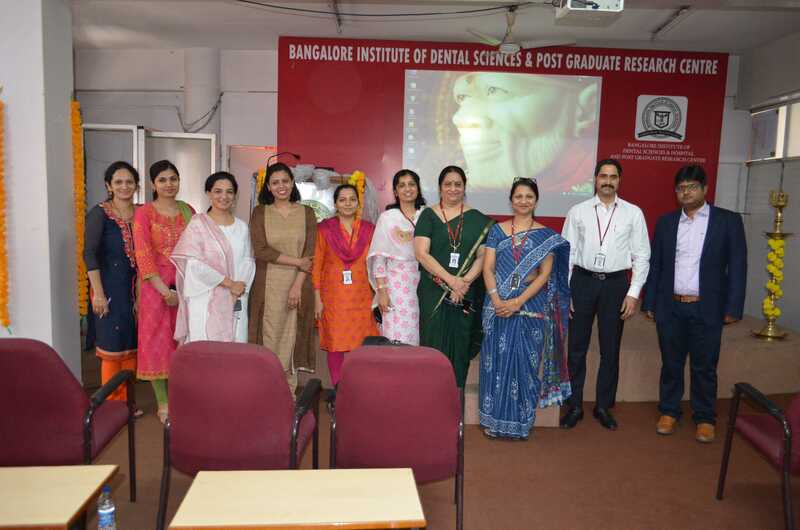 The quality of teaching opened many doors for me & I have developed an interesting & successful career path that owes much to my training in Bangalore Institute of Dental Sciences. 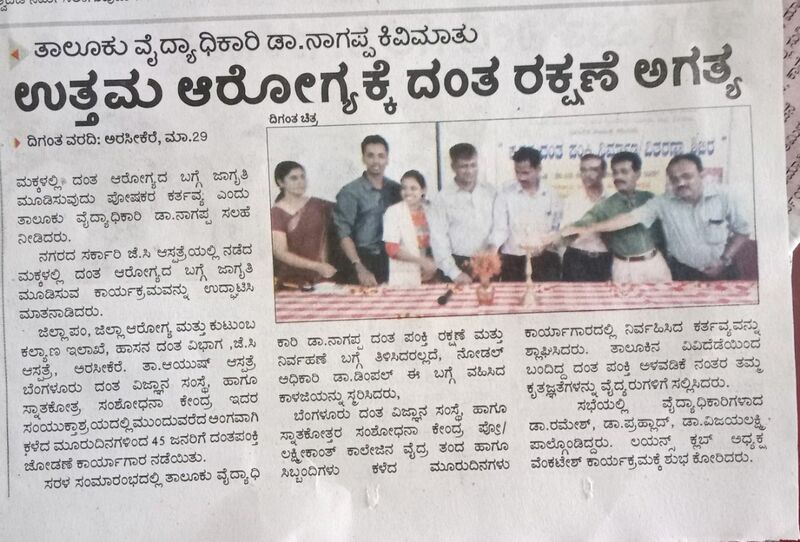 I thank my lucky stars when I took a seat into this prestigious college through Karnataka CET. 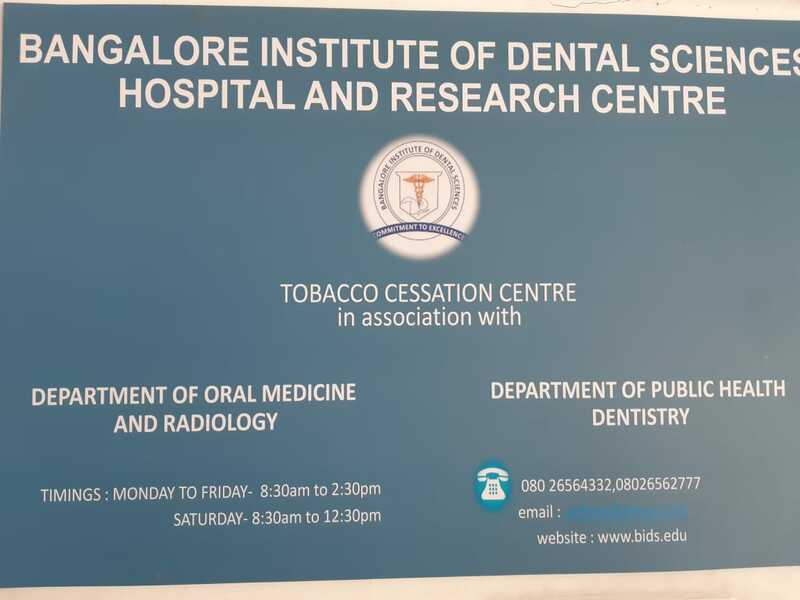 Bangalore Institute of Dental Sciences and Post Graduate Research Centre has always boasted of highly experienced faculty and up to date infrastructure. 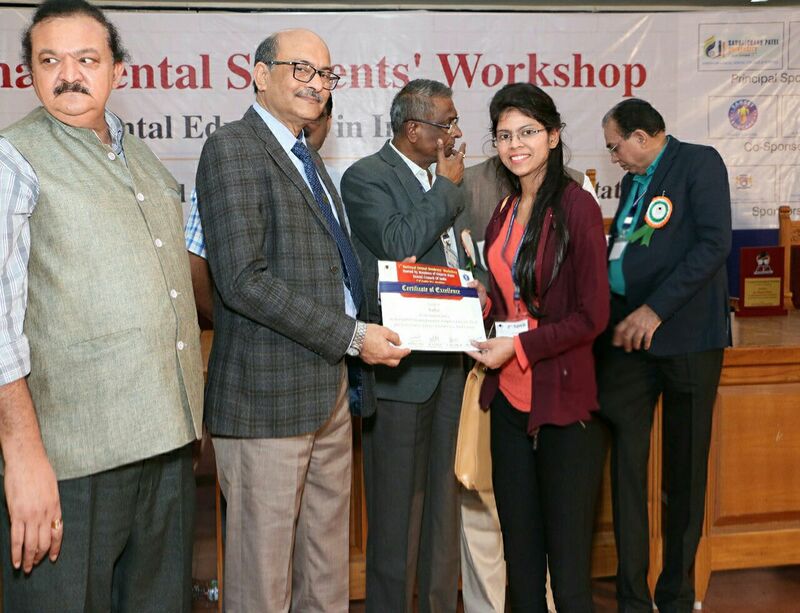 It was indeed a blessing to be a student of the movers and shakers of Dentistry in India. 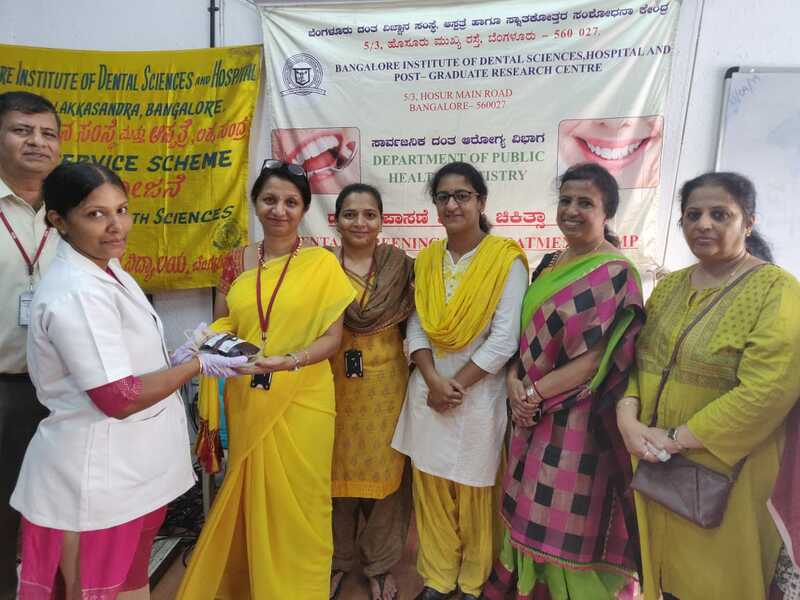 The college has been associated with various NGOs which conducted innumerous Dental camps outside the city which further helped us gain vast clinical experience. 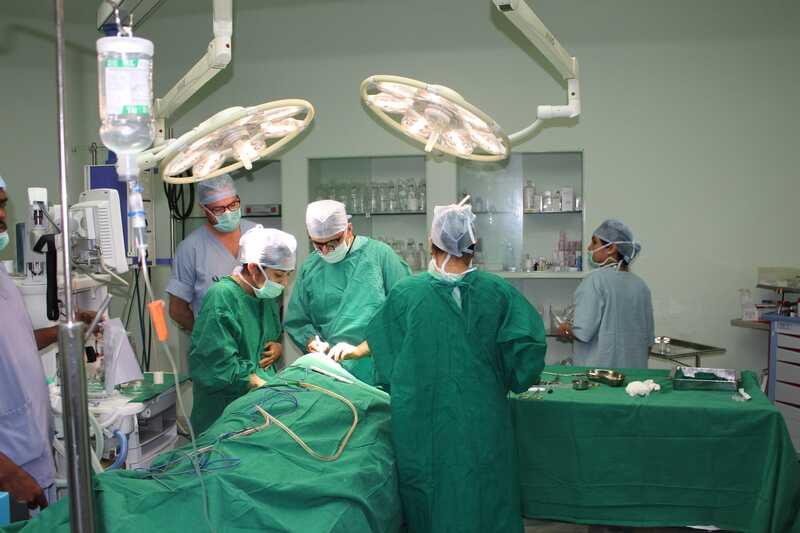 Situated in the heart of the hustle and bustle of city , it ensures massive patient inflow which is critical for clinical knowledge. Every day of my 5 years in this institution was a learning experience for me which transcended beyond dentistry. With the annual Cultural and sports events It ensured overall development of the student. Even after passing out I am in adept with the college activities and I swells my heart with pride to see my alma mater reach newer heights every day under the dynamic leadership of our Chairman and Founder. BIDS have indeed been the best decisions of my life. Being from another state altogether and with no local guardians, I chose to spend 10 years of my life in BIDS. That sure does tell the tale! BIDS has one of the most impeccable teaching line-ups. The teachers are very approachable and impart in depth knowledge of subjects, making it easy for the students. 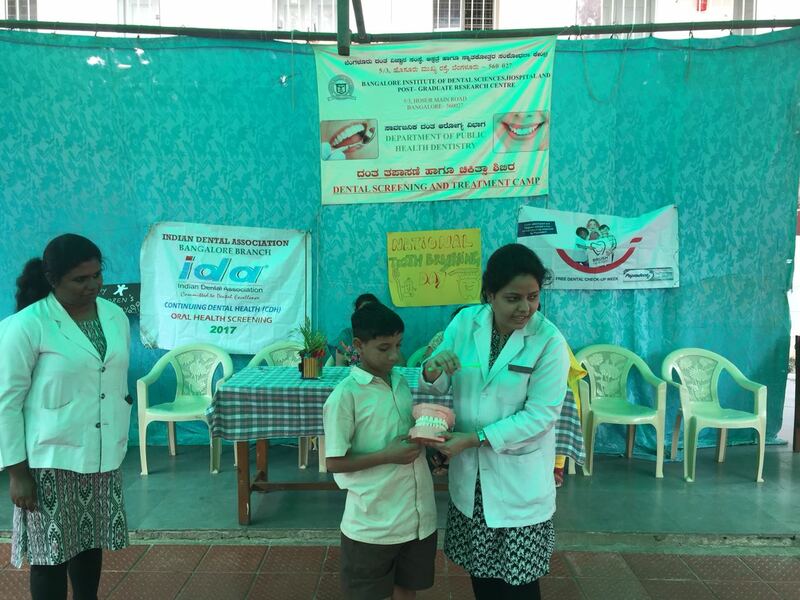 They not only ensure that the students are ethically, morally, principally strong as dentists with updated knowledge but also help mould them into better human beings. 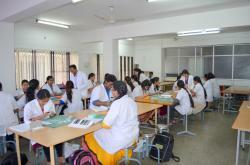 Apart from the exemplary teaching staff, the college is equipped with all facilities. Having chosen Orthodontics and Dentofacial Orthopaedics as my Post Graduation and Research branch, the teachers guided me at every step while at the same time gave me the freedom to openly discuss cases without hesitation. The 10 years that I spent here have not only carved out an efficient Orthodontist from me, but blessed me with a family away from home, in the same department! Looking back, would i have chosen the best college of my state, my answer is NO! I can proudly say that I am an alumnus of BIDS. Being a localite, someone during the counselling of the Common Entrance Test mentioned to me that BIDS boasts of the best academics in town. God bless that soul, because I chose BIDS to realise that, and more! Not only are the academics par excellence here, one will be amazed at all the talent displayed in the extra curricular activities. From just academics to patient management to cultural celebrations, the teachers are involved at every step. The teachers ensure that the students are not only theoretically and practically strong but also possess inviolable grounded ethics. 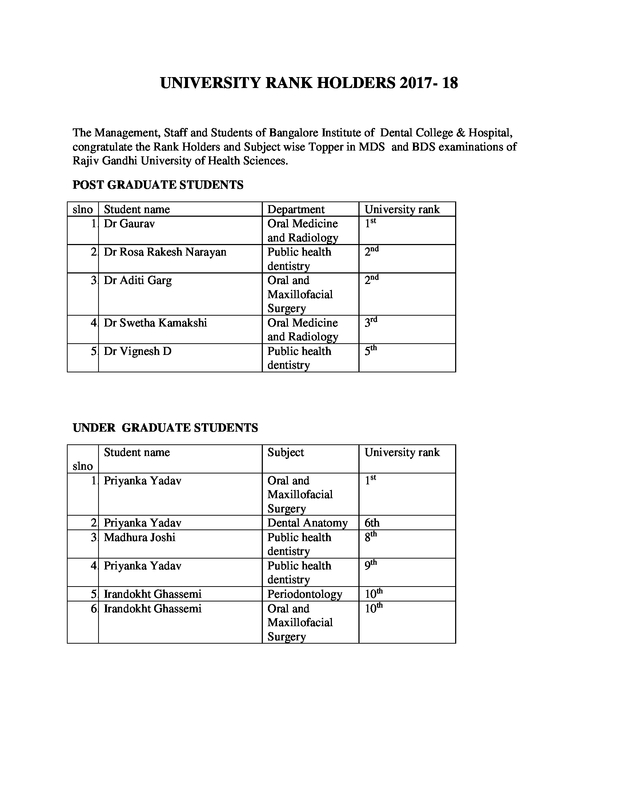 Concomitantly, the graduates are not only good doctors but more importantly good human beings too! Having chosen to pursue Masters in Conservative Dentistry and Endodontics after BDS, in this very college, I must add, it was the transitional phase of my life. Along with in depth knowledge of the subject, I also have learnt many valuable lessons for life. The teachers here are a treasure trove of an amalgamation of strong righteous old school principles and modern sciences. A precious rare combination! Not only are they great in their jobs but are also stalwarts in their respective fields and yet so humble and approachable. Indeed one of the best colleges in town! I graduated in 1999 from Bangalore Institute of Dental Sciences & Hospital, Bangalore. I am so grateful for the help of college staff throughout my training as an undergraduate. They were always willing to give help and advice when I needed it. 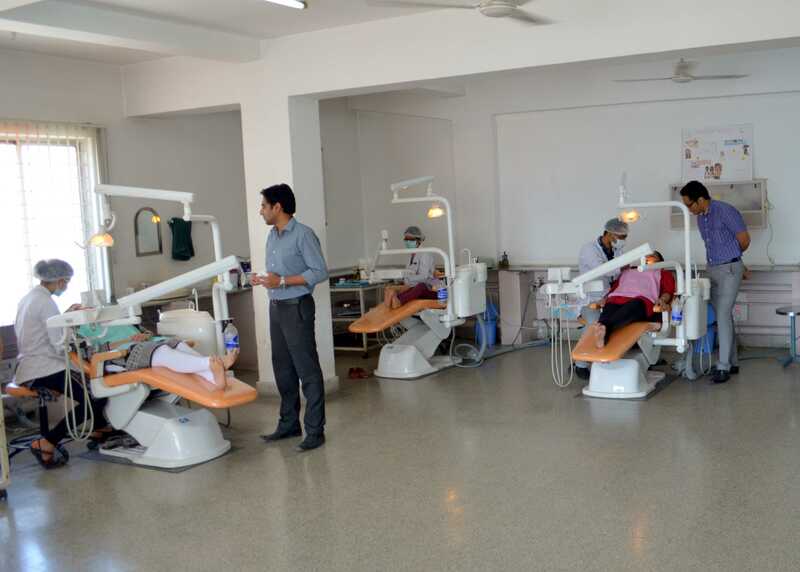 The availability of highly specialized dental clinics of dedicated teaching faculty makes it all the more conducive for the students to realize their true potential, and finally establish themselves in life. The institution is lead by a team of highly qualified experienced teachers, who through their dedicated efforts uphold the integrity of the college. I looked for a dental college with a good location, a good faculty, and well equipped clinical departments with all the facilities for graduates & postgraduates. BIDS fit all these requirements. I came to India for studying graduation. 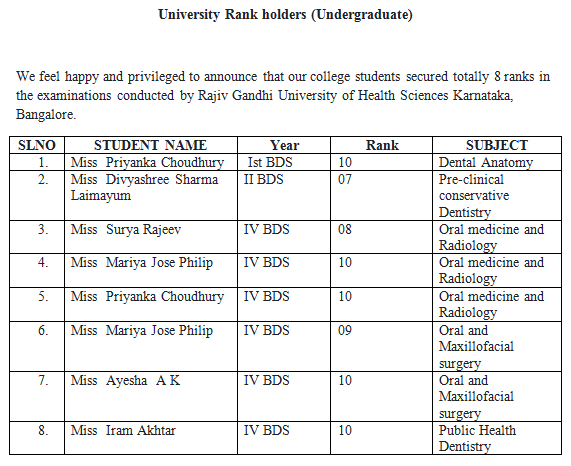 I selected BIDS, Bangalore in 2012, because it is one of the best dental colleges in India. The organization provides so many facilities for learning and updating our knowledge. The biggest fear coming to India was language as I had to deal with local people and communicate with them but, I was so fortunate to have friends and seniors who helped me get through easily and at last ,I learnt basics of local language and now I myself can manage independently. The BDS program no doubt was rigorous but the faculty was very motivating. They gave personal attention to each student academically. All 4 years I scored first class marks. 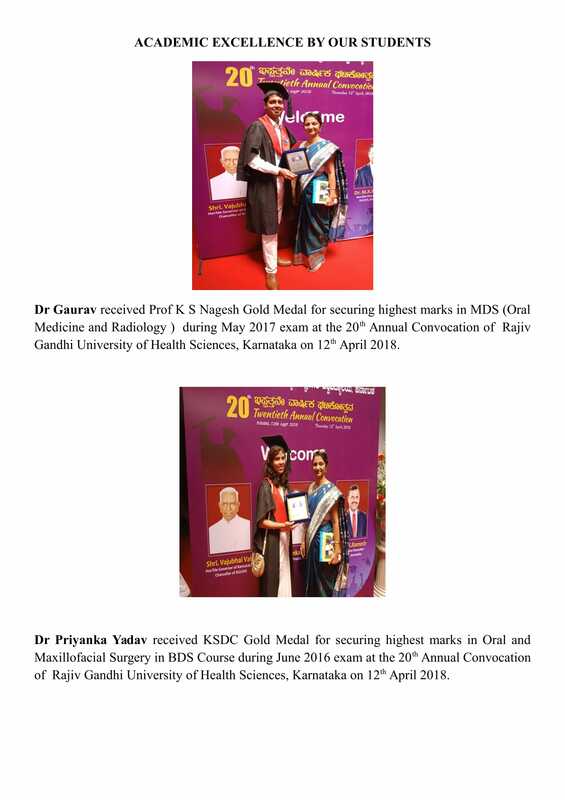 I feel so blessed with very senior and experienced faculty as well as state of art laboratories with sophisticated and advanced instruments on which students are allowed to work themselves. The college has a very conducive atmosphere for education and research, as it offers MDS and post doctoral dental programmes. Also that allows one to continue their higher studies in the same college. We get plenty of opportunities to develop our all round personalities not only through excellent academic atmosphere but also through various co-curricular, cultural and sports activities. The people in BIDS are so friendly and welcoming. If I had the chance to do it over, I would definitely be right back at BIDS!